Want help with home theater design in Portland? So you’re finally ready to put in a home theater system in your home. You know you want a quality surround system and the best picture possible. You have a dedicated room built just for your home theater. But how can you set it up for maximum effect? If you’d like some help optimizing your home theater design in Portland, make sure to check out Flat Panel Pros We’re experts at enhancing the quality of your home theater system. From expert home theater installation to furniture placement to sound acoustics, if it has to do with your home theater, we’re pros. Wondering what all those TV settings are? They really do mean something! Have you noticed how many of the display units at electronics stores have an eye-popping picture? You may have even bought the exact same model, and oftentimes, it just doesn’t look the same at home. That’s because the electronics department carefully calibrates the image settings to the ideal quality based on room environment such as light and shadow settings and expected viewing distance to make it really stand out. With our help, we can install your TV so it looks just as good and probably even better than the unit in the store. We’ll explain everything as we go along if you’d like so you can play around with it on your own after we leave, but we’ll do our best to make it looks the way you want it to be! Have a great sound system but need help with placement or installation? Home theater installation done right takes your movie and TV experience to the next level. But putting them in can be a pain. We can help. Our technicians have the experience and equipment necessary to create the audio experience you’ve always dreamed. We can mount your speakers on your walls and ceiling for you and hide the wires from sight (and tripping!) so you can proudly show off your incredible system. When you choose us, you choose a local company that wants to give you the best home theater system possible for your home. We treat you fairly and don’t have any hidden costs or fees. Based on your viewing preferences, we’ll even tell you when it’s a good idea to indulge or when the high-end equipment upgrades wouldn’t be worth the price so you can save money. 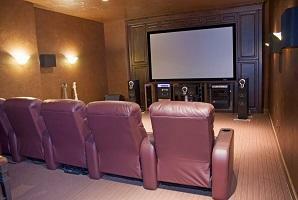 So if you’re looking for some home theater design input from seasoned technicians, give us a call or contact us today!